Connectivity of the internet reveals that human labour can often be organised more efficiently in the context of community than in a corporation. The best person to do a job is the one who most wants to do it and the best people to evaluate them are their peers. Crowdsourcing analysis of images from the Sloan Digital Sky Survey is a great example. It is the rise of the network that allows us to exploit a fact of human labor that long predates the internet: the ability to divvy up an overwhelming task – such as the [email protected] project – into small enough chunks that completing it becomes not only feasible, but fun. The open source software movement is a classic example of crowdsourcing. From November 2000 to September 2001, NASA ran an experiment called Clickworkers which proved showed that public volunteers, many working for a few minutes here and there and others choosing to work longer, can do some routine science analysis that would normally be done by a scientist or graduate student working for months or years on end. Once upon a time there were producers and consumers. Their roles were static and well defined. But now thanks to the internet and cheap, powerful and easy to use computing technology the line between them has become blurred. Despite its unchallenged reign throughout the 20th century, the traditional corporate structure is an artifact of the industrial revolution. But this is changing and the average size of companies is falling due to forces like outsourcing and the decentralisation of decision-making. Given the right conditions, a randomly selected diverse collection of people will outperform a collection of the best individual problem solvers who are more homogeneous in their thinking and experiences. The usefulness of being in a large network with weak ties to many people is often underestimated: The majority of people find jobs through distant acquaintances, friends of friends who are quite different from them rather than their closest buddies whom they share many common personal and professional interests with. The crowd will give away their time – their excess capacity – enthusiastically, but not for free. It has to be a meaningful exchange. A website/project’s profits have to come second, or they won’t come at all. Don’t try and control community discussions, you cant issue directives to a community, you can only offer suggestions. Kiva.org is the perfect example of a successful croudsourcing project. Kiva uses the internet to crowdfund small loans from philanthropically minded people in the West to give entrepreneurs in developing countries a hand up rather than a handout. Kiva often faces a problem rare amongst charitable non-profits,: too many donors! its popularity means there are often more people who want to lend money than there are possible recipients for a loan. A good example of crowdsourcing is the use of thousands of personal computers for parallel processing of data for astronomical research. 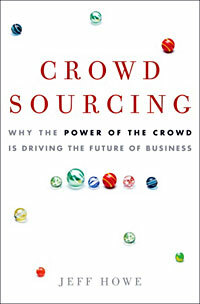 I will read this book first and then make my view on crowdsourcing. Neerav do you think this will be the downfall of marketing and reviews? no longer will we need to depend on what “non experts” (or people who are not really in the community) tell us about a product or service, rather the community will be providing it’s own useful reviews and coming up with their own products and providing their own services.